Frank Sinatra, Elvis Presley, Lena Horne, Sammy Davis Jr. 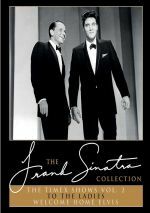 The Frank Sinatra Collection brings together some of Frank Sinatra's finest performances on television and in concert. This release combines his two final Timex TV shows from 1960. Back in the late 1950s/early 1960s, Frank Sinatra headlined four TV specials that aired on ABC. With The Timex Shows Volume 2, we get the second pair of these programs. To the Ladies (59:28) ran February 15, 1960. This show matches Sinatra with guests Lena Horne, Mary Costa, Eleanor Roosevelt, Barbara Heller and Juliet Prowse. Welcome Home, Elvis (59:27) aired May 12, 1960. This program connects Sinatra with guests Elvis Presley, Joey Bishop, Sammy Davis Jr., Nancy Sinatra, Leona Irwin and the Tommy Hansen Dancers, and Peter Lawford. When I discussed Timex Volume 1, I noted a substantial “star power imbalance” between its two shows. The same factor crops up with the pair of programs here, as “Welcome Home” provides a much stronger roster of luminaries. Obviously Presley remains the cream of that crop, as he’s the only Timex participant arguably more famous than Sinatra himself. Throw in Davis and “Welcome Home” delivers three legends. With “Ladies”, Horne offers the only performer who maintains any form of real stardom, but as talented as she was, Horne doesn’t approach the level of fame attained by Presley or Sinatra. Of course, Roosevelt was awfully well-known, but she’s not an entertainer, so she doesn’t really fit this discussion. Even after Presley and Davis, “Welcome Home” enjoys minor star power. Nancy Sinatra maintains fame due to “These Boots Are Made for Walking”, and Bishop and Lawford still have some Rat Pack notoriety. Irwin and the Hansen Dancers seem to be lost to the mists of time, but the rest maintain name value. This doesn’t prove true for the remainder of the “Ladies” group. As I noted in the prior review, I wasn’t yet born when these shows aired, but I still enjoy some familiarity with most of the participants. That said, the “Ladies” largely remain unfamiliar to me. Prowse also appeared in Volume 1, and as I noted there, I knew a little about her from 1970s TV appearances, but that was about it, as she didn’t maintain a lot of fame past the era of these specials. That’s still more than I can say for Heller or Costa. Actually, as a Disney fan, I knew Costa as the voice of Prince Aurora in Sleeping Beauty, but otherwise, she’d be forgotten. That’s still more than I can say for Heller, a comedian I’d never heard of at all. A look at IMDB shows that her career was essentially done by the end of the 1960s, and Wikipedia doesn’t even bother to list her. In the case of Timex Volume 1, the “star imbalance” didn’t doom the episode with the “lesser lights”. Actually, though I gave the show with Bing Crosby and Dean Martin the nod due to its cast, the second program worked better – if I ignored the fun that came via the sight of Sinatra, Crosby and Martin together, the other show offered more entertainment. That doesn’t prove true with Volume 2, as “Welcome Home” provides both bigger stars and better material. “Ladies” just never quite comes together, and its cadre of guests doesn’t help. While I do recognize her talents, I admit I never cared for Horne’s vocal style – she mugs and smirks her way through songs and croons in a broad, over-accentuate manner that grates on me. Nothing about Horne’s appearance here changes my mind. As for the others, they fail to stick to the screen. Both Costa and Prowse shows their skills reasonably well but don’t make a terribly positive impression. “Ladies” fails to mention Costa’s work on Sleeping Beauty, which seems odd given the film just came out the prior year. Even weirder, the episode presents a performance that feels like a ball scene from Beauty, but it involves Prowse, not Costa. Roosevelt adds some class to the proceedings but she seems out of place. Her lack of ability to read cue cards in a competent manner makes her appearance unintentionally amusing. More unexpected comedy comes from the show’s opening segment. Sinatra croons the title song as he rides a camera rig, and he looks deeply uncomfortable with this set-up. It’s unclear why this process seemed to bother Sinatra so much, but it’s bizarrely entertaining to watch his discomfort. Speaking of which, the sight of Sinatra and Presley creates a certain level of awkwardness, as Sinatra never showed much love for rockers like Elvis. It seems clear that “Welcome Home” exists for ratings purposes, as I can’t imagine Frank was too happy to have to greet Elvis as the returning hero. Still, Presley’s presence was a major coup for Sinatra, as “Welcome Home” marked his first appearance as an entertainer after two years in the Army. I don’t know if it brought in the ratings Sinatra desired but it seems like a big “get”. While Presley’s appearance might have helped ratings, I can’t imagine it did much for Elvis himself, as a guest shot on a Sinatra special didn’t help his credentials as a rock star. The combination of current rocker and old-style crooner doesn’t fit, especially because “Welcome Home” tries desperately to fit Elvis into Sinatra’s box. Few signs of Presley the rocker manifest in the thoroughly mainstream “Welcome Home” – not that we see much of Elvis anyway. After a brief appearance during the show’s opening, Presley doesn’t pop up again until the 40-minute mark, and after 10 minutes, he leaves the building. When we do hear from Presley, “Welcome Home” neuters him to a degree. After two mildly rocking solo songs, he duets with Sinatra on material arranged solely to suit Frank’s style, and this really defangs the rocker. Though “Welcome Home” doesn’t really allow him to shine, it still seems stunning to contrast Presley’s style with that of Sinatra and the other guests. This show demonstrates why the old crooners viewed Presley as a threat: he truly offered something radically different and more visceral. Outside of the brief Presley sightings, “Welcome Home” provides sporadic entertainment, though it falters more than it succeeds. The show plays as a “timeline” to let Elvis know what he missed during his two years in the Army, and this means some odd and embarrassing moments. Hopelessly tone-deaf dance performance that attempts a “tribute” to the Japanese emperor? Check. Terrible rip-off of Alvin and the Chipmunks? Check. General lack of ability to relate to the generation enticed by Elvis? Triple check. Still, there’s a certain magnetism that comes with the sight of Sinatra along with Presley – however brief this may be – and both Davis and Bishop manage to provide some enjoyable material along the way. “Welcome Home” botches its main purpose – our renewed acquaintance with Elvis – but it still gives us a few good moments. “To the Ladies” fares less well, so this ends up as a mixed bag of TV specials. Still, even with some weak moments, I like the ability to ride the time machine and see these slices of entertainment history. Frank Sinatra: The Timex Shows appear in an aspect ratio of 1.33:1 on this single-sided, dual-layered DVD. Due to those dimensions, the image has NOT been enhanced for 16X9 televisions. As was the case with Volume 1, these shows came with many problems. Actually, Volume 2 may have looked a little worse than its predecessor, though it’s rough visual sledding either way. Sharpness remained iffy, as the shows tended to seem soft and fuzzy, with prominent edge haloes. Instances of shimmering and jaggies cropped up, and source flaws were a prominent issue. I saw instances of specks, spots, thin lines and general distortion/interference through the episodes. Blacks remained wan and flat, and contrast was problematic, as the shows usually appeared too bright – except for the part of “Welcome Home” that came with such a dark tint that it looked like Sinatra worked in blackface. As was the case with the first DVD, V2 was acceptable given its age and origins, but don’t expect attractive visuals. Once again, the same issues greeted the Dolby Digital monaural audio of Timex. Quality remained thin and tinny, with little range on display. Dialogue appeared intelligible, but the dialogue lacked natural tones. Effects were a minor consideration, but music played a major role, and the songs showed lackluster reproduction. The tunes appeared flat and failed to manifest much oomph. Some background noise interfered with the audio as well. This became problematic sound that earned a “C-“ due to age and origins. The DVD package includes no extras. Though not quite as entertaining as Volume 1., The Timex Shows Volume 2 still maintains value. It’s a hoot to see Frank Sinatra and Elvis Presley together – albeit briefly – and other moments work well, too. The DVD offers flawed picture and audio and lacks bonus materials. 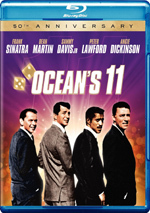 Even so, this disc retails for less than $10, so Sinatra fans will need to give it a look.